The G20 summit in Brisbane, Australia, has ended, capping a week of summits that saw several awkward encounters between U.S. President Barack Obama and Russian leader Vladimir Putin. Australia, the host of this year’s G20 wanted this meeting to focus on trade and job growth, but it was President Obama’s efforts to isolate Vladimir Putin on the sidelines that got center stage at the summit. During the meeting in Brisbane, the two leaders saw each each other on a number of occasions. 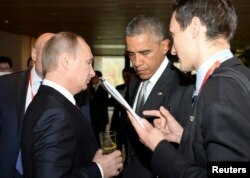 Following the conclusion of the summit, Obama reviewed the encounters. “I would characterize them as typical of our interactions, which are businesslike and blunt. And my communications to him was no different than what I’ve said publicly as well as what I’ve said to him privately over the course of this crisis in Ukraine and that is: Russia has the opportunity to take a different path,” Obama stated. The tensions between the two men were obvious before both leaders came to Brisbane. At the APEC summit in Beijing last week, the two men often appeared to look in each other’s direction but not at each other. U.S. President Barack Obama (2nd R) talks to his Russian counterpart Vladimir Putin (L, front) during the Asia Pacific Economic Cooperation (APEC) Summit in Beijing, Nov. 11, 2014. White House aides later confirmed there had been a series of informal conversations in which Obama confronted Putin on Ukraine and called on Russia to abide by a September cease-fire agreement. Photos of one meeting showed the two men focused on each other, neither of them smiling. As evidence mounted that Russian equipment and troops were crossing the border into Ukraine, Putin appeared to be going on a charm offensive at public gatherings in Beijing. On opening night of the APEC summit, the recently divorced Russian leader was caught on camera putting a shawl on the wife of Chinese President Xi Jinping. Her aides promptly removed the shawl and replaced it with one of her own garments. The scene triggered a slew of critical comments on Chinese social media, with some bloggers calling Putin’s gesture improper and demonstrating poor taste. Similarly as a side note, Obama was criticized for chewing gum at public events in Beijing. Things did not get better for Putin later in the week in Australia, where Obama did not waste the chance to isolate the Russian leader. The U.S. president called a trilateral meeting with allies Australia and Japan and they issued a statement making clear their opposition to Russia’s annexation of Crimea, its actions to destabilize eastern Ukraine, and calling for those responsible for the downing of Malaysia Flight 17 to be brought to justice. And Obama raised the pressure further by meeting with European leaders and agreeing that sanctions against Russia should remain in place. "At this point the sanctions that we have in place are biting plenty good," he said. "We retain the capabilities and we have our teams constantly looking at mechanisms in which to turn up additional pressure as necessary." Harper’s aides confirmed the exchange happened. British Prime Minister David Cameron also confronted Putin. Cameron is quoted as telling Putin relations between Russia and the West have reached a fork in the road on Ukraine. Australian Prime Minister Tony Abbott called on Putin to "atone" for the shooting down of a Malaysian passenger jet over rebel-held eastern Ukraine. Work began Sunday to remove the wreckage of the passenger jet four months after it was shot down, killing all 298 people aboard. Russia has denied any link to the incident, which happened four months ago. In another development, Russian state-run television aired photos Saturday showing what it said was proof a Ukrainian fighter jet shot down Flight 17 over eastern Ukraine in July. Ukrainian sources said the photos are forged. Authories have never been able to prove who is responsible for shooting down the aircraft, killing all 298 people on board. Western countries largely blame pro-Russian separatists for the incident. However, Obama left the door open for Russia’s leader to mend relations with the international community. “If he continues down the path that he is on, violating international law, providing heavy arms to the separatists in Ukraine, violating an agreement that he agreed to just a few weeks ago, the Minsk agreement that would have lowered the temperature and the killing in the disputed areas, and providing us a pathway for a diplomatic resolution then, the isolation that Russia is currently experiencing will continue,” Obama said. While other heads of state, including Obama, stayed in Brisbane hours after the summit’s conclusion, the Russian leader boarded his plane shortly after a leaders’ luncheon and departed Brisbane. Putin told the Ria Novosti news agency that his early exit had nothing to do with tensions over Ukraine. But Putin acknowledged the disagreement with other world leaders. "Yes, on some points our views don't coincide, but the discussions were substantive, frank and friendly," he said. Meanwhile, Ukrainian President Petro Poroshenko issued several decrees on Saturday, shutting down state institutions in pro-Russian eastern Ukraine. The new measures include directives to shut down all state companies operating in rebel-held territory within a week and to evacuate state workers. They also urge Ukraine's Central Bank to close down all banking services in rebel-held regions, including card operations. Poroshenko already has ordered an end to state funding to the separatist Luhansk and Donetsk regions, following rebel-sponsored local elections last month that were seen as illegal by the United Nations and Western governments. Authorities said those cuts were largely aimed at subsidies and social payments, including pensions, but would not affect natural gas flow to rebel areas during winter months. Poroshenko's move further separates Ukraine's separatist-dominated Donetsk and Luhansk regions from the rest of the country. Poroshenko said the situation in eastern Ukraine must be resolved through dialogue with the Russian-backed separatists. However, he also said Friday the Ukrainian military is "willing and able to fight back" if a cease-fire collapses completely. Putin has said he wants to reach a compromise with Ukraine, but the Kremlin denies having any soldiers or weapons in rebel-controlled areas. NATO and European observers report seeing Russian tanks, troops and weapons crossing the border into eastern Ukraine this past week. The cease-fire, declared in September, has been violated consistently almost since the day it was signed.